Of all the sweets that come from Turkey baklava is probably the most famous and delicious. Although there is no consensus on the history of the dessert, it is believed that baklava descended from an Assyrian dessert consisting of dried fruit in between two layers of pastry. 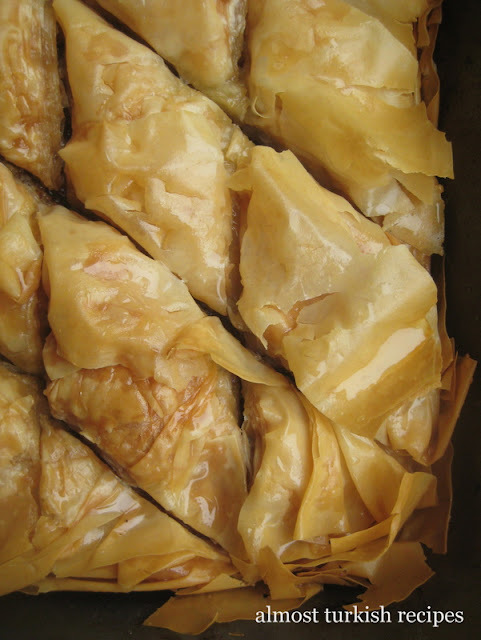 There are numerous debates about the "original origin" of baklava, most famously between Speros Vryonis, professor of Greek and Byzantine history, and Charles Perry, food historian and journalist. While Vryonis claims the dessert has Byzantine roots, Perry insists on its Turkish/Turkic origin. Regardless of its origin, baklava, a closer version to the one we know today (with multiple layers of thin pastry), came from Damascus to the Turkish city of Antep (Gaziantep), and from Antep to the rest of Anatolia. By the end of its journey it came to perfection at the Ottoman palace kitchens. It became so prominent in the palace tradition that by the end of 17th century a ceremony called "baklava alayi (parade)," during which janissaries walked to the palace on the 15th day of Ramadan to fetch trays of baklava--one for every ten soldiers-- prepared by the palace cooks, was already established. 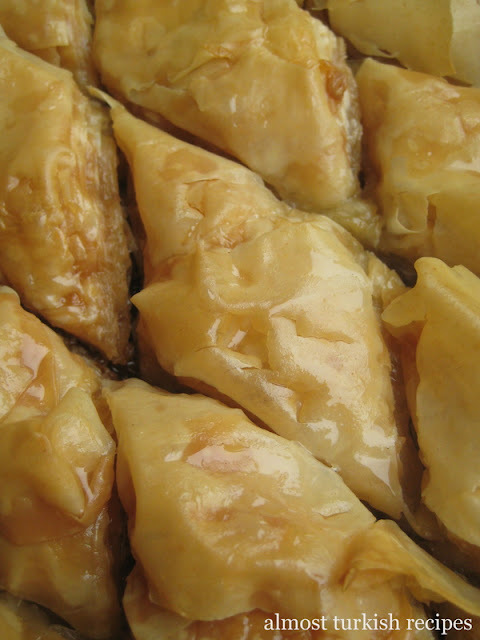 Today baklava is still a specialty and sold at stores that specializes only on baklava. In these baklava stores one can find different versions of layered thin pastry desserts with different ingredients and different cuts. Turkish baklava is made by very thin layers of pastry made from wheat starch and a sugary syrup that does not contain honey or spices. Antep being the city that spread baklava to the rest of Turkey preserves its prestige over the dessert. Almost all baklava store owners/chefs in Istanbul or elsewhere claim to be from Antep, the baklava and pistachio capital of Turkey. Among the Turks the biggest debate over baklava seems to be the stuffing: some like walnut and some pistachio, and it can be a heated one. However, the hazelnut baklava from the Black Sea region is also noteworthy. Being totally on the walnut camp, I will give you an easy-to-make walnut baklava recipe that you can make with store bought phyllo dough. -Thaw the phyllo dough following the instructions on the package. -Grease the baklava tray. The tray can be slightly smaller than phyllo sheets. -Place a layer of phyllo sheet at the bottom and drizzle 1 tbsp butter on top. -Spread the half of the phyllo sheets on the tray, buttering them one by one. -Sprinkle the ground walnuts on top of the middle layer. -Cover the walnuts with the other half of phyllo sheets, again buttering every single one. -When the sheets are finished, with the help of a knife push the edges inwards into the tray. Now the hardest part: cutting the baklava. Baklava has to be cut before it is baked. The most traditional cut is the diamond cut. But you can go for triangles or simple squares. -For diamond cut. 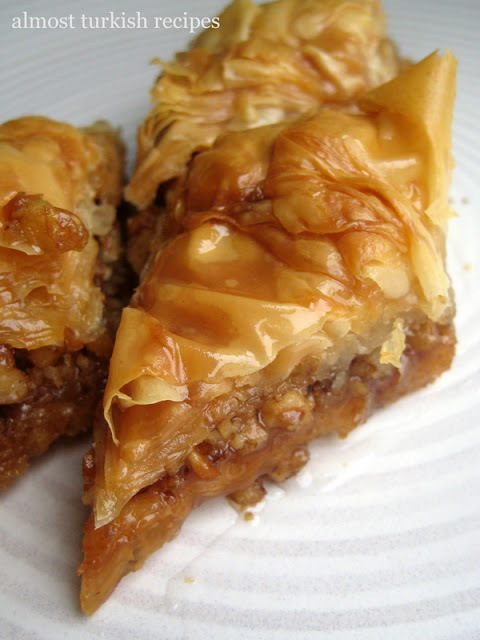 First find the sharpest knife in your kitchen and cut baklava into 4 or 5 equal pieces lengthwise. Then cut it diagonally at 1 inch intervals. -Drizzle the remaining butter on top. -Bake baklava in a preheated oven at 350F until golden brown. -For the syrup, mix sugar and water and cook stirring constantly until sugar dissolves. First bring to a boil then let it simmer on low for ~20-25 minutes. -Add lemon juice 10 minutes before you take it off the stove. -Turn it off, and let it sit for 10-15 minutes. IMPORTANT: Baklava has to be COLD when you pour the syrup. So, you can bake it beforehand or start making the syrup as you take baklava of the oven. And on the other hand the syrup should neither be boiling hot nor cold. It will be at a good temperature to pour after 10-15 minutes off the stove. -Pour the syrup on top slowly, one cup or scoop at a time and let it soak. Wait at least 1 but better 2 hours to cool and absorb the syrup. One of my favourites - I prefer it with pistachio, but a mix of pistachio & walnuts makes it a little cheaper! Like Carolyn, I do not use lemon juice...my husband is from Antep and says this is the 'proper' way! By the way - how many ounces or grammes is a stick of butter? For light simple syrup make 1:1 sugar to water. medium syrup 2:1. heavy 3:1. I would make heaby syrup for baklava. I actually use honey 2:1 honey to water. Does 3 cups of water and sugar make it super super syrupy? Will it be too dry if I use 2 and 2? I made it as per the recipe, but I missed that you don't add the lemon juice until part way through boiling. My husband loves baklava and wanted to surprise him. The taste is right, but mine is a soggy mess. Too much syrup. It was a lot of work for these results. Disappointed. Helen, Carolyn says she does use lemon juice. But if you can avoid sugar crystallization without lemon juice, that's great. 1 stick is 1/4 pound so ~113 grams. KK--3 cups does not make it super syrupy. I tried to make it with 2 cups (I don't like it too syrupy either) but 2 cups is simply not enough. Baklava would still be partly dry after 2 cups. OMG, I can't wait to try and make this! Thank you! This recipe makes it look so easy! I am afraid of pastries. But mmmm, homemade baklava, with all that BUTTER! Delicious! One of best desserts on the planet! Thankyou for noticing my mistake - I meant to say I DO use lemon juice. And thankyou for explaining a stick - in the UK we only use ounces or grammes! Baklava is one pastry I love to eat but don't make very often; love your version. I just heard about this recipe and not yet tried. I read that this come from old countries to enrich the dinner tables of the Americas. It looks interesting and delicious. Hello....just a recommendation...instead of sugar you can use honey!! Is healthier and tastes great too! My Greek friend uses honey! Great recipe and some mouth watering photos. I adore baklava - looking forward to going back to Turkey so I can savour some more scrumptious treats! Yum! Fill up my plate, please. I'll cheerfully be your on-line taste-taster. What a perfect recipe for the upcoming holidays! Baklava is amazing. oh my God.. I ADORE this dessert... thanks for the recipe - I'll wander in your blog since I've been in Turkey and I tasted a great variety of good dishes - but it's not easy to find the correct recipes where I live..
Oh! it is so delicious desert liked it.I am found of walnut so i liked it very much.It is heavy eating one is enough for our stomach. I can't wait to try this recipe. Can I substitute honey for sugar? Will I have to change the proportions? Out of curiosity, why do they use sugar more often than honey for baklava? Cali, in Turkey honey is never used in syrup based desserts like baklava. I think that's Greek way of making it. Well, if there was ever a recipe to inspire me to play around with phyllo pastry again, this would be it. Fantastic. I have used honey and without but since you really can't tell the difference I usually just leave it out but I always use 🍋 lemon or lemon peel. Great recipe I am going to stop making all the layers and just do the one. Also I make a combination of almonds and pecans. I don't care for walnuts at all. Sometimes I use pistachios and almonds. Thank you! Just like we make it but we use rose water in the syrup. 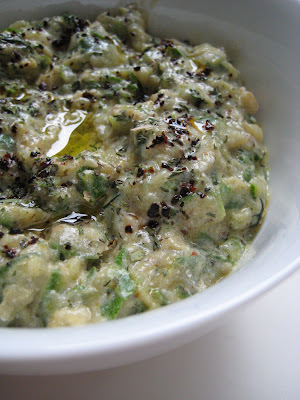 Our family's traditional Lebanese recipe. Syrup was too runny and there was way too much of it. If the baklava isn't cold and the syrup isn't hot, then the syrup might seem too much, because it cannot be soaked. I tried this and it bombed. Oops. I think I didn't let it bake long enough (it was a light golden brown) and it was a soggy watery mess and tasted terrible. I don't think I brought the syrup to enough boil and it didn't thicken enough. Does that sound like common errors when making this recipe? Bethany, you definitely need to boil the syrup and then simmer for half an hour. And baklava MUST BE COLD when you pour the hot syrup.